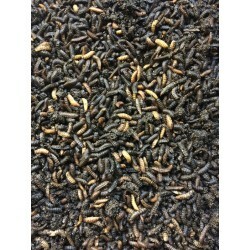 Couple of weeks ago I found this I don't know what type of plastic container in a rubbish bin near a marina so I took it back as I could do something for the Black Soldier Fly Larvae. The bottom has a conical shape so I thought it would be great for drainage. The dimensions of the container are 44cm (17in) diameter, 30cm (12in) deep and the tapered zone is 18cm (7in) high. Today I decided to make a mini protapod. I started to make the ramp by cutting a triangle out of a foam play mat for kids. It is glued to the container using some aquarium grade silicon caulk. I then fitted a 32mm PVC pipe with a 90 degrees elbow on the outside, due to the design I had in mind I had to use some Liquid Nail to hold the PVC elbow in place on the outside. A cutting disk and drill bit on my rotary tool allowed me to cut an opening in the PVC pipe for the larvae to fall inside. The inside opening of the pipe is closed with a piece of fly screen. Three wooden fence pole are used for the legs fitted with screws and sealed with silicon caulk. I then added a ring of Velcro to prevent larvae to crawl horizontally and escape. The only thing left to do is some holes drilled on the bottom to allow drainage and I will fill the first two inches with gravels and sand and then 3 inches of coco coir as the filter. I already have several egg clusters that have hatched in a separate container, ready to go into this new BSFL homemade mini Protapod. I tested the legs strength by filling the bin with water before drilling the drainage hole. After the whole has been drilled, I started adding a layer of gravels. Then a layer of coco coir chips. I verified the drainage is working. I topped up with mulch as I was running of coco coir and then transfered the content of a grow out container where some eggs were hatching into. The lid of a 180L (47 gallons) plastic drum fitted this bin perfectly. I temporarily installed one gravel on each leg and put the lid on top of them, this creates a little gap for airflow and allow the female BSF to enter. I will replace them with some screws with thick head and maybe install a small hinge. 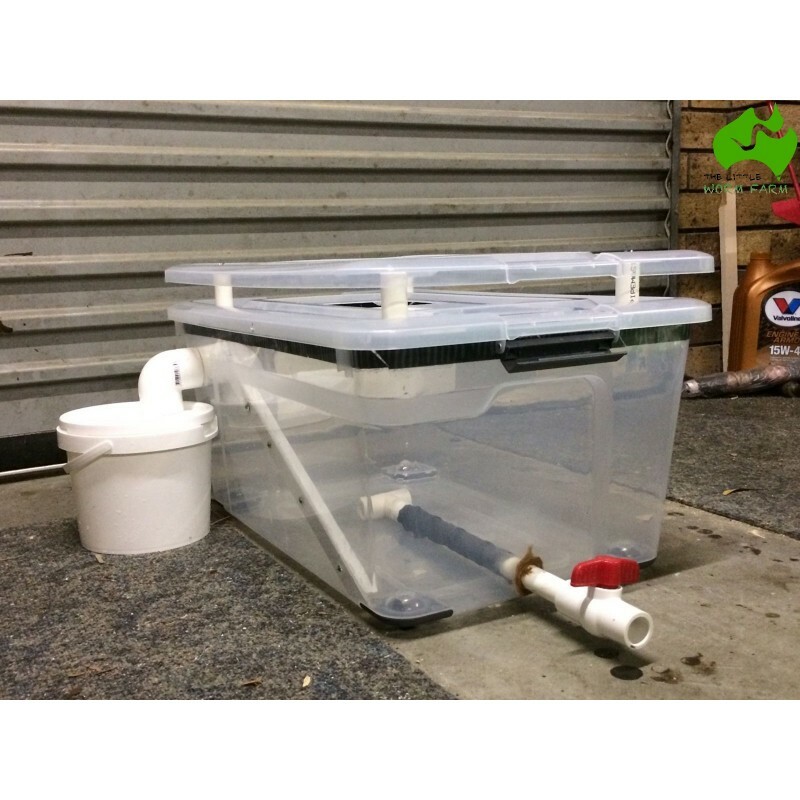 This could also work nicely as a worm bin or an AACT brewer. the small section of 32mm PVC pipe was an off cut, so I consider that free.